The San Antonio River Walk (also known as Paseo del Río) is a network of walkways along the banks of the San Antonio River, one story beneath downtown San Antonio, Texas. Lined by bars, shops and restaurants, the River Walk is an important part of the city's urban fabric and a tourist attraction in its own right. Today, the River Walk is an enormously successful special-case pedestrian street, one level down from the automobile street. The Austin City Limits Music Festival (ACL Festival) is an annual three-day music festival in Austin, Texas' Zilker Park. The Festival brings together more than 130 bands on eight stages playing rock, country, folk, indie, Americana, hip-hop, reggae, electronic, and bluegrass. Over 65,000 visitors are attracted to the event each day. Named after the legendary PBS concert series, the festival is produced by C3 Presents, who also co-produce the Lollapalooza festival. The Alamo, originally known as Mission San Antonio de Valero, is a former Roman Catholic mission and fortress compound, site of the Battle of the Alamo in 1836, and now a museum, in San Antonio, Texas. The compound, which originally comprised a sanctuary and surrounding buildings, was built by the Spanish Empire in the 18th century for the education of local Native Americans after their conversion to Christianity. In 1793, the mission was secularized and soon abandoned. Guadalupe Mountains National Park is located in the Guadalupe Mountains of West Texas and contains Guadalupe Peak, the highest point in Texas at 8,749 feet (2,667 m) in elevation. It also contains El Capitan, long used as a landmark by people traveling along the old route later followed by the Butterfield Overland Mail stagecoach line. Visitors can see the ruins of an old stagecoach station near the Pine Springs Visitor Center. Camping is available nearby at the Pine Springs Campground. South by Southwest (SXSW) is a set of film, interactive and music festivals and conferences that take place every spring in Austin, Texas, United States. SXSW first began in 1987 and is centered on the downtown Austin Convention Center. Each of the three parts runs relatively independently, with different start and end dates. 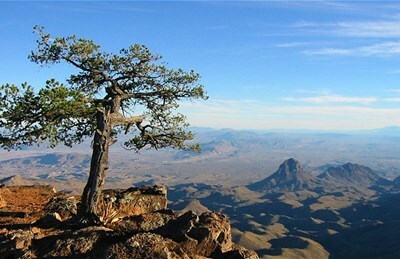 Big Bend National Park is a national park located in the U.S. state of Texas. For more than 1,000 miles (1,600 km), the Rio Grande/Río Bravo forms the international boundary between Mexico and the United States, and Big Bend National Park administers approximately 244 miles (393 km) along that boundary. Natural Bridge Caverns are the largest known commercial caverns in the state of Texas. The name was derived from the 20 m (65 foot) natural limestone slab bridge that spans the amphitheater setting of the cavern's entrance. The span was left suspended when a sinkhole collapsed below it. The caverns are located near the city of New Braunfels, Texas in the Texas Hill Country next to the Natural Bridge Wildlife Ranch, a drive-through wildlife safari park. The Texas School Book Depository (now the Dallas County Administration Building) is the former name of a seven-floor building facing Dealey Plaza in Dallas, Texas. Located on the northwest corner of Elm and North Houston Streets, at the western end of downtown Dallas, its address is 411 Elm Street. The building is notable for its connection to the assassination of U.S. President John F. Kennedy.